Quite often we need to use word processing software to fill and customize our PDF forms before converting them back to a PDF format. In such situations, it would be very helpful to have a tool that could convert PDF to Word. In the past, you probably had to create a Word document from scratch and copy text from a PDF file, or if the copy function was unavailable, you would type the text manually. It goes without saying that it was was a tiresome and time­consuming process. Now there is a far easier way to convert PDF to Word. You can simply use PDFfiller! On the page that appears next, click the "Word" button, and the PDF will automatically be converted to a Word file which will be saved onto your computer. If the PDF document is already uploaded to your account, check its box in "My Documents", and click "Save As" on the right. On the page that opens next, click the "Word" button. When you use PDFfiller to convert PDF to Word online, you get a Word document which you can easily edit with a word processor like word or Google Docs. If you like being able to convert PDF to Word, you might be interested in a whole lot of other great features that PDFfiller has to offer, including conversion of PDFs to Excel and PowerPoint formats. Check out these tutorials to see the other great things that PDFfiller can do for you! To convert a PDF to word online, upload your document to PDFfiller. PDFfiller online editor instantly converts any PDF document to an editable format online. You can edit your PDF with our various tools and features. To sign your fillable form, click the 'Signature' or 'Picture' button to sign your document or insert an image. To create a fillable PDF form, click the 'Add Fillable Fields' tab on the right and add fillable fields for text, signatures, images or more. When you're done with editing, click the 'Done' button and convert your PDF as a word document. How Convert PDF to Word? Where can I find a free PDF to Word converter? 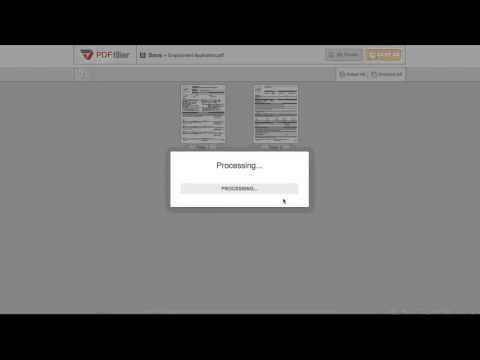 You can convert your PDFs using PDFfiller. PDFfiller is a PDF converter which can instantly convert any PDF document to an editable format online. You can edit your PDF with our various tools and features. To convert PDF to Word for free, upload your document to PDFfiller. PDFfiller can instantly convert any PDF document to an editable format online. Edit your document with our various tools and features. When you're done with editing, click the 'Done' button and convert your PDF as a Word document. To convert PDF to Word online, upload your document to PDFfiller. PDFfiller can instantly convert any PDF document to an editable format online. Edit your document with our various tools and features. When you're done with editing, click the 'Done' button and convert your PDF as a Word document. Can I convert a word document to PDF? Of course you can. To convert a word document o PDF, upload your document to PDFfiller. Edit your document with our various features and tools. When you’re done with editing, click the ‘Done’ button and save your word document as a PDF file.